The Roman recipe is a curiosity. They fried to a crispily crunchy on the outside while still leaving a bit of chew on the inside. The pieces were easy to cut into shapes, and could probably even be rolled into logs. The flavor is really all about the honey, but the pinch of pepper and cinnamon on top adds a slight level of complexity. The Modern recipe knocked our socks off. These fritters are like Winnie-the-Pooh-gasms. Between the spiced sauce and the incredibly luscious texture, we ended up gobbling them and shamelessly licking our fingers. The winner? We had imagined Tyroshi Honeyfingers to be sort of a tasty sweet street food. The Roman variety is fun because of its historical significance and ease of shaping, but wouldn’t be easy to make in a dusty alleyway. 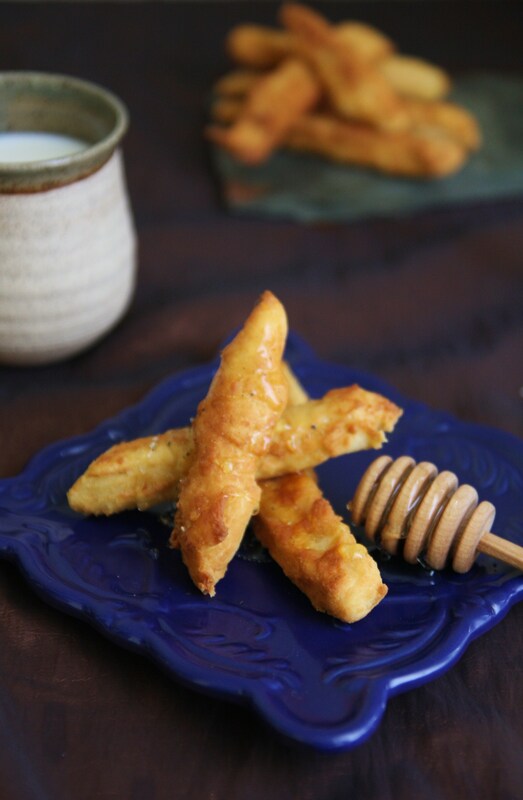 The modern version is SO good and is made basically like carnival fried dough, so fits our loose criteria for a great honeyfinger. Modern Wins! Get the recipes in The Cookbook! These sound absolutely amazing! I would love to try both. Also, in the Roman recipe, does the pepper/cinnamon get added to the batter, honey, or just get sprinkled on top? The spices get sprinkled on top, after the fritters have been honeyed. Hope you enjoy them! This sounds delicious! *drool* Anything that requires honey is ok in my book! Agreed! I can’t get enough of it! This sounds absolutely amazing. I can’t wait to try it! I just made the modern version. I used a pastry bag to drop into the oil. They fried up perfectly and were nice and crispy. If I made them again I would make a few tweaks to the syrup but overall they were pretty good. I tried out the modern version of these over the weekend; I could not find cardamom seeds anywhere in town, so I ended up substituting a heaping half teaspoon of ground. The sauce was a bit harsh at first, but I made it in the morning and stashed it in the fridge all day while I worked. After about 8 hours it was fantastic! The flavors had mellowed and mingled together to make a spicy, smooth sauce tasting predominantly of honey. I wasn’t thrilled with the ‘fingers i made, but I’ll definitely be making the sauce again! Just made these as a test run for a SoIaF costume party I’m hosting this weekend. A lot of fun, and a yummy snack! I blogged about it here: http://getoccupied.blogspot.com/2011/07/tyroshi-honeythumbs.html. Thank you guys for all these recipes! The book infers the honey fingers were baked, while you opted for frying – just wondering why you went that way with it, and what your thoughts were on a baked variation of this dish. Love the site and everything you’ve done with it, keep up the great work! Those are amazing, and will absolutely be made. Thanks for the tip off! I think I might add some spice to the batter next time, but this was an exquisite dessert. I served it with the honeyed chicken and crusty bread (mine didn’t crusty, but I didn’t do the water-trick) and some green beans that I sauteed with bacon & almonds (want to add pearl onions next time). Very good. My guests ended up eating their entire portion of the sauce and even dipped their chicken into it. :) My husband said it “tasted like Christmas.” High praise and I’m very grateful for the recipe. It’s sure to go in my recipe box! I recently used the modern one as a recipe for loukoumades, because I had to make a greek dish for a dinner, but it didn’t work because the dough never rose. I was confused if the cling wrap was supposed to sit on top of the bowl, or be pressed down onto the batter. I originally pressed it down and it started rising, but the top was getting bubbly so I moved the cling wrap to the top of the bowl. After two hours, the top was still liquidy, but the bottom was sort of a dough texture. I waited a little longer to see if it would end up rising, but it never did. Any tips for what I should do next time? Hmmm…good question. We’ve actually revamped our modern recipe (sad, because loukoumades are AMAZING), and we last made this some time ago. From what I recall, we pressed the cling film onto the dough mixture. Changing the placement of the film might have somehow altered how the air circulated in the dough. When you say cardamom seeds, do you mean 10 of the little seeds in the pods or 10 of the pods? We made the Roman version last night and it was pretty good eating them right away. The dough is kind of plain tasting without the honey or spices, but not bad. If we do this again we might add some sugar to the dough and then fry it in honey instead of oil. The leftovers got a bit soggy after sitting in a pool of honey all night, but I toasted them and they were pretty good, thought not as good as fresh. I made these and they didn’t come out as crispy as I imagined. They were good, reminded me of a doughnut, but my thought was maybe instead of frying them in deep oil, I’m going to fry them in a drier pan more like an egg. I add spices to my dough (i do that with everything) and it was good. The sauce is wonderful and I am going to find more applications for it. They sound amazing but where is the recipe?